It is now time to reduce the number and density of retail outlets selling tobacco. Retail supply restrictions are both a logical component of policies that will achieve a tobacco-free New Zealand by 2025, and what the majority of consumers want. Marketing is predicated on largely common-sense principles; among these, accessibility and visibility are particularly important. Most of us will have purchased products on impulse when grocery shopping, even when we have taken lists with us and been determined not to depart from these. Unplanned purchases illustrate how highly visible in-store stimuli such as shelf-talkers, end of aisle displays, and sampling booths can entice even the unusually rational among us to deviate from our plans. In-store visibility is not the only factor to cue our behaviour. The mere availability of products, and the ease with which we can access them, is also very important. Nearly a century ago, Robert Woodruff, chairman of the Coca-Cola Company, recognised the importance of accessibility when he said that Coca-Cola should always be ‘Within an arm’s reach of desire’. Imagine his excitement if he could see soda vending machines prominently located in hospital foyers throughout his country and many others. It’s a curious irony that many of the products offering greatest benefit to us – fresh fruit and vegetables – are typically more difficult to locate than those we would be better to avoid. For this reason, it’s perhaps not altogether surprising that, although tobacco products are unique because of the indisputable harm they cause, they are nonetheless available from at least 5000 outlets. Research released recently shows nearly half of these outlets In New Zealand are located within 500m of a school. 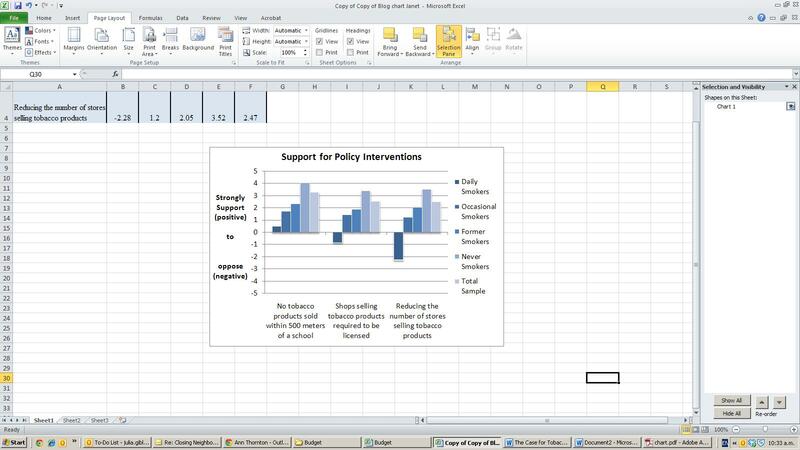 This finding led the researchers and groups advocating for public health to call for further investigation of retailer licensing, together with other measures that would reduce the ease with which young people can access tobacco products. The New Zealand Association of Convenience Stores (NZACS), which carries British American Tobacco and Imperial Tobacco’s logos on its website, quickly decried the research as anti-tobacco, as though this charge somehow invalidated the research findings. According to an NZ Herald item, NZACS chairman Roger Bull dismissed the findings as coming from: “tobacco control activists out of Otago University lobbying the Government for another whack on New Zealand retailers”. Disingenuous references to nicotine addiction as “a consumer demand” conveniently overlook the fact that most smokers regret starting smoking and half of those addicted to smoking will die prematurely from an illness caused directly by smoking. Put plainly, Bull’s statement amounts to a claim that tobacco profits should trump public health. That is, the “important revenue stream” provided by sales of tobacco products is more important than the health and well-being of New Zealand’s young people. Even if Bull’s arguments had a sound logical basis, they are so far out of line with public opinion that they should be immediately dismissed in any considered analysis. In another recently published paper, we found smokers and non-smokers supported not allowing tobacco sales within 500 metres of a school. As the graph below shows, creating a protective perimeter around schools had very strong overall support among the general public (more than 3 on a scale where complete opposition was -5 and complete support was +5). 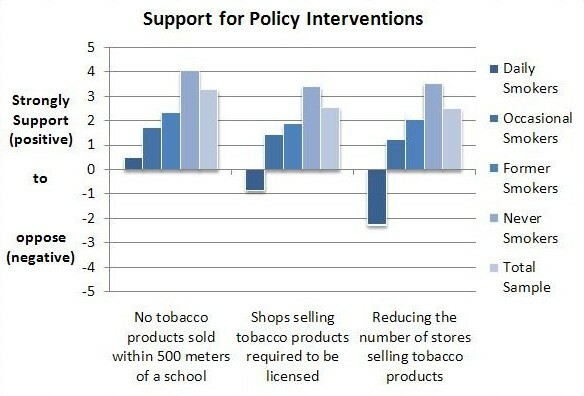 Although daily smokers opposed the introduction of retailer licensing and reducing and reducing the number of stores selling tobacco products, they were the only group to oppose these measures, which both had strong overall support. 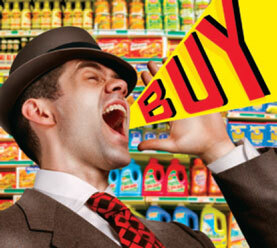 I also question whether Bull speaks on behalf of all retailers. Our research shows that at least some retailers feel ambivalent about selling tobacco because they see first-hand the harm it causes their communities. Retailers who placed tobacco products out of sight long before they were required to do so, or who voluntarily stopped selling tobacco, saw many benefits follow and were applauded by their communities. Making tobacco less visible and more difficult to access recognises it for what it is: a pernicious product that kills 5000 New Zealanders every year. Work undertaken by members of the ASPIRE2025 theme contributes to a much wider evidence base that provides important guidance to policy makers charged with achieving the Government’s goal of a smokefree Aotearoa / New Zealand by 2025. Because consumers know how easy it is to make impulse purchases, they understand and support the logic of restricting the availability and sale of tobacco products, particularly to young people. Policy makers and politicians have all the evidence they need to introduce retailer licensing, restrict tobacco outlet numbers, and provide greater protection from smoking to young people. It is time political leaders acted on local and international research and accelerated progress to end New Zealand’s tobacco epidemic, by further restricting the availability of tobacco. Henriksen, L. (2012). Comprehensive tobacco marketing restrictions: promotion, packaging, price and place. Tobacco Control 21(2): 147-153. This entry was posted in Uncategorized and tagged smoking, tobacco by gibju57p. Bookmark the permalink.